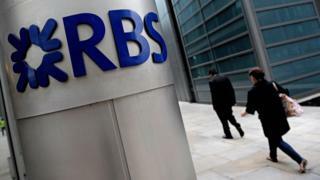 Royal Bank of Scotland has agreed a $4.9bn (£3.6bn) penalty with US regulators, paving the way for the government to sell down its 70% stake. The long-running probe focused on the sale of financial products including toxic mortgage bonds in 2005-7, ahead of the financial crisis. RBS was bailed out by the government at the height of the financial crisis. Chief executive Ross McEwan said the settlement will create a "cleaner bank" that is easier to sell. Chancellor Philip Hammond said the agreement "marks another significant milestone in RBS's work to resolve its legacy issues, and will help pave the way to a sale of taxpayer-owned shares". Shares in RBS rose 4.3% in morning trading to 287.9p. The settling of the outstanding penalty for RBS' role in the financial crisis was the last obstacle standing in the way of selling the government's enormous 71% stake back to the private sector in what will be the biggest privatisation in UK history. The government owns over £20bn worth of shares. That is a colossal amount to sell and will take several years. The first sales will be at a loss, but the government will hope that over time, as the huge overhang of shares to sell dwindles and profits continue to rise, the public may get more money back. The public though are unlikely to ever recoup the £45bn poured into the biggest banking debacle in UK corporate history. RBS said about $3.6bn of the penalty would be covered by funds already set aside. Many analysts had forecast that the settlement could be larger than $4.9bn. Last July, RBS paid another hefty penalty of $5.5bn to the US Federal Housing Finance Agency. The US Department of Justice said further details must be negotiated with RBS before a final deal is done. But Mr McEwan called the settlement a "milestone moment" for the bank. "Removing the uncertainty over the scale of this settlement means that the investment case for this bank is much clearer," he said. Jane Sydenham, from Rathbone Investment Management, told the BBC: "Removing this final cloud will make a difference, it will mean the government can press ahead with a sale and it can start to look forward, rather than spending all their time worrying about what happened in the past." RBS is the last in a line of major banks to pay penalties to the DoJ for their activities ahead of the financial crisis. In March, Barclays agreed a $2bn settlement with US regulators, and Deutsche Bank paid $7.2bn. Rivals also charged by the DoJ include Citigroup, JPMorgan Chase, Credit Suisse, Morgan Stanley, Goldman Sachs and Bank of America.